As you are well aware by now, Bimmer has made her debut. And we kinda, maybe, sorta can't get enough of her. 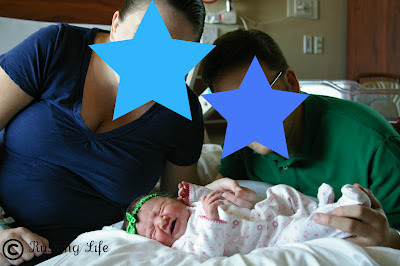 But I thought I would share a bit of her birth story with you! Apparently, that's the thing for mommy bloggers to do. And since technically I am now a blogger that's a mom, I feel obligated. So, "labor" technically started for me during week 37. The baby dropped super low, I dilated to 2cm. and effaced to 70%. By week 38, I was up to 3cm. dilated and 80% effaced. We were soooo certain she was going to come soon and put me out of all that uncomfortable late-pregnancy misery. Except, at my week 39 appointment, I hadn't increased any. Awesome. However, they gave us the good news that we could induce on May 24th. It was such a weight off our shoulders to be able to plan people's visits and get finished packing and get the house in tip-top shape. Then on the 23rd, something felt "different" to me early that morning. Not long after Puff left for work, I began the fabulous "bloody show" portion of labor. But I wasn't having any noticeably consistent contractions, so I spent most of the day on the couch, trying not to freak out. Around 2:30pm on the 23rd, I started to have menstrual cramps. They were pretty strong, so I just curled up in bed and tried to get comfortable. I talked to several friends and tried not to let Rach's horror stories of 20 hour labors get to me. Not what someone petrified of labor wanted to hear!!! 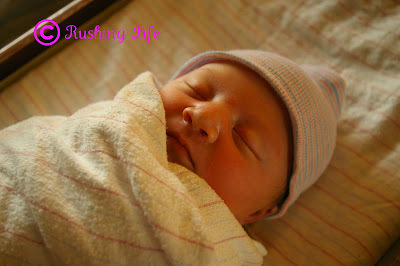 Around 4pm, the contractions started to come in 10 minute intervals. Puff was still at work, trying to wrap up loose ends for his upcoming time off. They started to come closer to 7 minutes apart around 6pm, but Puff was still at work. I took a shower, since the pain was going around to my back and the hot water felt good. Also, yes, I am vain enough to admit that I didn't want to go to the hospital without freshly washed hair. Puff finally got home around 6:30pm and we went to a local Mexican restaurant for dinner. I was writing down contractions in between eating a quesadilla and chips! Round about 8:30pm, the contractions were definitely coming every 6 to 8 minutes apart, so we decided to pack it up and go to the hospital. Well, after we finished watching "Chelsea Lately" from the night before. I managed to walk myself into the hospital, but by the time they got me in a gown and into bed, I was definitely in a good bit of pain. They checked me and I was only 3 1/2cm dilated, but my contractions were then 2 to 4 minutes apart. The doctor actually said I could go home and sleep in my own bed if I wanted, but the pain was mounting, so I opted to stay. 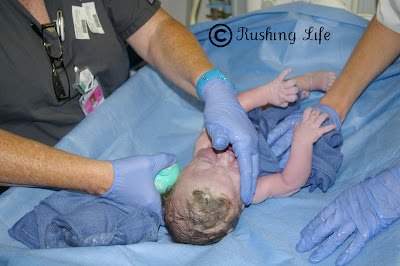 Around 10:30pm, after several painful trips to the bathroom and a few bags of fluid, I was able to get an epidural. It was heavenly. They were waiting to see if my toes would get tingly, but before that happened, I had a contraction and couldn't feel it, so all was good! I got to about 5cm by midnight and around 2am, they came in to break my water. When they did, they said I was 10cm dilated and could start pushing! Apparently my epidural was working "perfectly" since I could still move my legs and feel the pressure of oncoming contractions, which helped with the pushing. It definitely took some getting used to and I got tired fast, couldn't catch my breath, and my arms were so sore from pulling my legs back. The doctor and nurse said they could see that she had a bunch of hair, but also that there was some swelling on her head. Cue two hours of strenuous pushing later and I was no closer to having the baby. She was stuck on my pelvic bone. The decision to have a C-section was made right then and there and within 10 minutes, I was being pushed down the hallway to the OR. Puff was very nervous and I was trying so hard to be stoic. I was scared to death when they wouldn't let him come in to hold my hand while they prepped me for surgery. But I just tried to stay calm and keep my mind focused on other things. Puff came in eventualy, all decked out in his scrubs, and held my hand and rubbed my head. The doctor said I would have a baby in about five minutes. And sure enough, there she was! They held Bimmer around the drape quickly for me to see as I started to cry when I heard her cry. It was amazing. As they were tending to the baby and Puff was snapping pictures, the doctor's started to patch me up. Someone asked me how I was feeling and I remember telling them I was having some pain on my left side, so they upped whatever was going into my IV. The next thing I know, I remember screaming "OW!!!!" at the top of my lungs. The nurse told me they were putting my uterus back inside. (Didn't need to know that, but thanks!) And that was the last thing I remember... they had to totally knock me out and apparently I was snoring within about 30 seconds. Since the C-section hadn't been scheduled, I only had an epidural and not a spinal. I remember sorta coming back when they rolled me from the operating table over to the bed to take me back to the room. They told me I had to hold Bimmer. I was so delirious. Although, I think I remember telling her that we were going to take her zorbing and white water rafting! I'm sure the nurses pushing the bed thought I was insane! It wasn't until a few hours later that I was really coherent enough to hold the baby or do anything with her, thanks to the heavy-duty IV drugs I had been given. But that was OK... Bimmer and I still got to bond. I will definitely have more stories to come about the rest of the hospital stay, our visitors, our homecoming, etc. But for now... just know that Bimmer was born via emergency C-section on May 24th at 4:53am, and minus having a giant cone-head (that's what happens when you push for 2 hours before a C-section apparently) she is absolutely perfect. 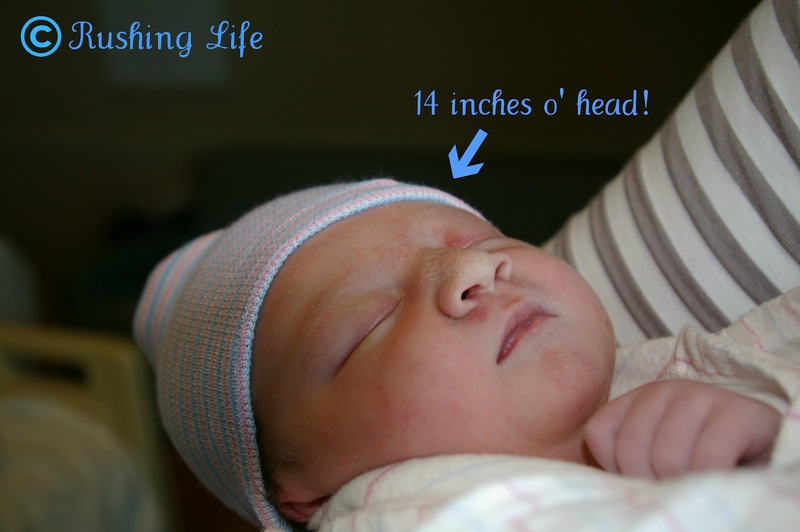 Our little chunkster weighed in at 8 lbs. 5 oz. and was 22 1/2 inches long. Puff and I are over the moon. We love our little girl with all our hearts. I finally have my family. What a story! So glad everything turned out okay! She is beautiful! I'm so happy for your little family!! !